Tags is a powerful tool as an additional way to organize your bookmarks. Imagine you are collecting bookmarks that you would like to use when you are bored. You could, of course, store them all in the same category. However, when one bookmark is related to IT news, another one to some funny jokes and a third one to some online tutorial, you might want to store them in the proper categories and still be able to access all of them at once. In this case you can assign the same tag to all of them. Searching for tags can be done through FavSync search or directly through your address bar. It will show you up to three bookmarks with that tag in the results list and an option to see all the bookmarks with that tag. You can only use AND / OR keywords for searching for multiple tags together. 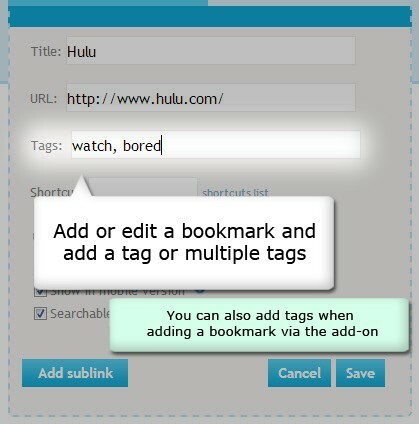 Example: bored read OR bored watch will show you bookmarks that have one of the two tags. 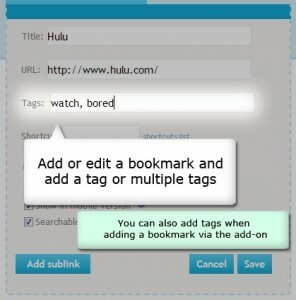 Example: bored read AND bored watch will show you only bookmarks that have both tags. We often search for stuff online, sometimes Google is good enough for the task, but sometimes we want to search inside a specific website directly (for example YouTube or Wikipedia). Direct Search was designed especially for that. Next to websites that can be searched directly you will find the search icon. By pressing on it, a search field will expand. Fill in your search and press ENTER. It will open the search result on that website directly. The unique thing about Direct Search is that you can do it on EVERY website that can be searched (compared to Chrome and Firefox built-in functionality that allows you to do it on specific websites only). 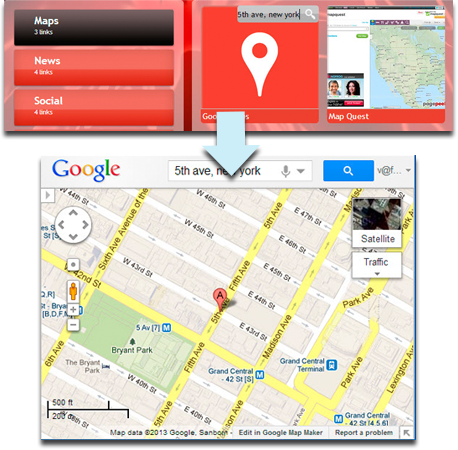 When you are adding a bookmark it is automatically checked if we have a search query for it. If we do, we will automatically add the search icon next to it, but if we don’t you can easily submit a new search query and start searching immediately. Recently we have added functionality that allows you to access bookmarks and search through them from the add-on and from the address bar. 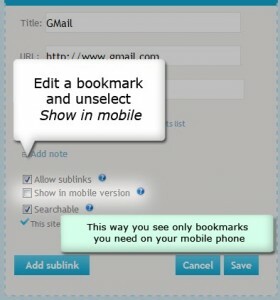 Since there are mobile apps for most of the websites you use nowadays, we introduce the “Show on mobile” checkbox. As you probably may have guessed, the ones that are not selected will not appear when accessing FavSync on your mobile phone. You can find it in the edit bookmark menu. 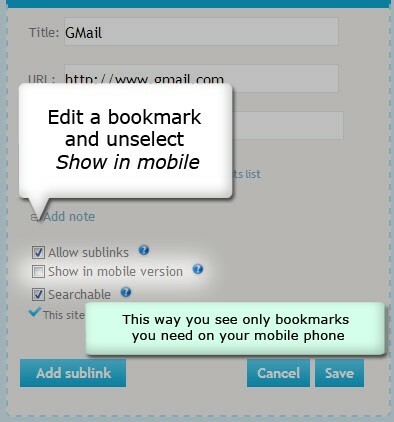 This way when you access your FavSync page from mobile phone, you see only the bookmarks you really need for your mobile. In case you want to see all the bookmarks, you can press on the computer icon at the bottom bar.